January 16, 2017. 3:30 pm Outside NY City Hall . 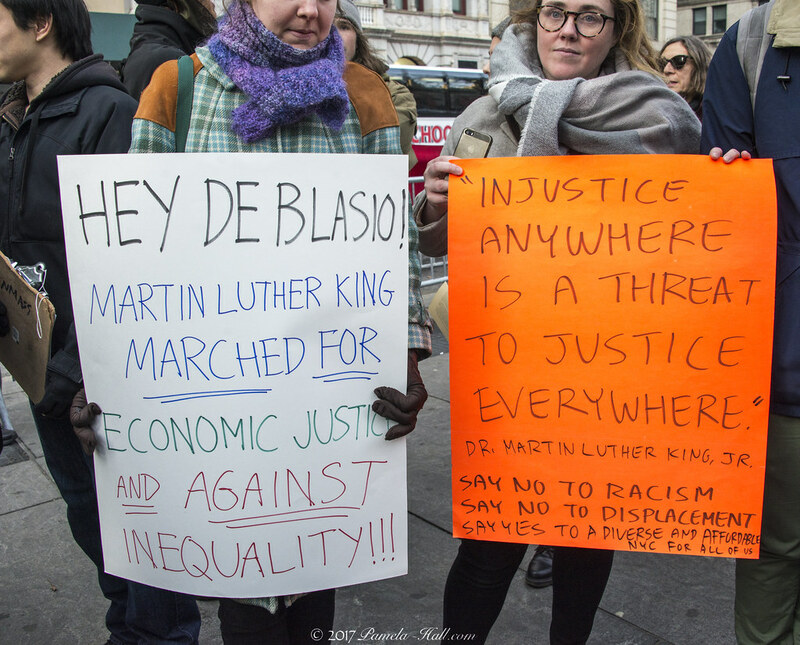 A Protest/Rally was led by a Coalition to Protect Chinatown and LES (the Lower East Side) on Martin Luther King Federal Holiday as they demanded racist Mayor Bill de Blasio STEP DOWN. 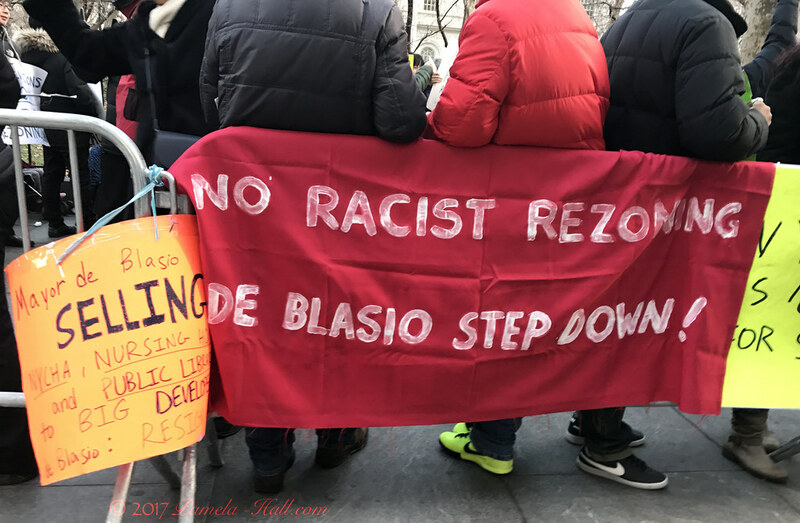 The Citywide Alliance Against Displacement demanded Mayor RED BILL step down because he was guilty ( the say) of promoting racist rezoning plans that targeted communities of color. They claim de Blasio (somehow) uses this holiday to cover up his racist policies (no examples were given of HOW he does this). 1. End racism in city planning. 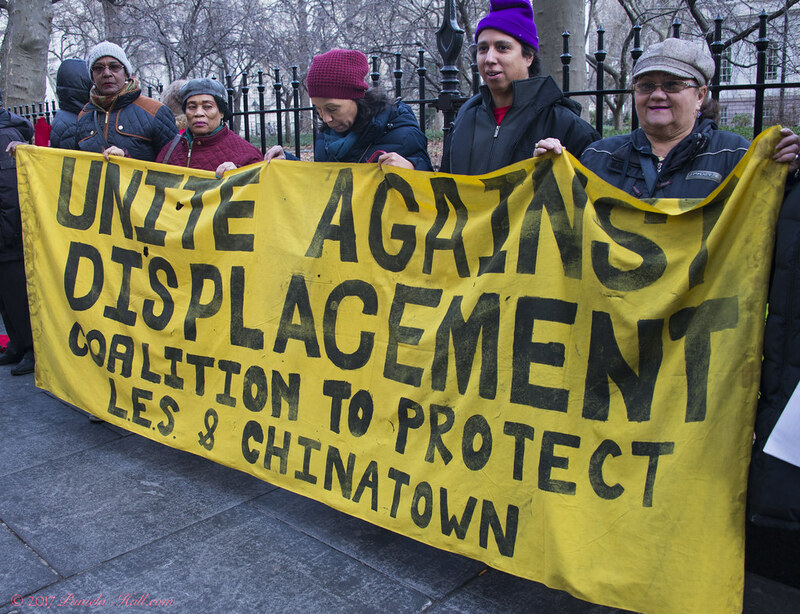 Pass community-based “People First” plans like the Chinatown Working Group rezoning plan. 2. End public funding for luxury development, such as 421-a. Instead, use public resources to preserve and build more permanent low-income housing. 3. Stop privatization of public land and assets. 4. Mayor DeBlasio and those in City Council who also collude with developers to step down. Whatever. The rally was really about housing. and rezoning. 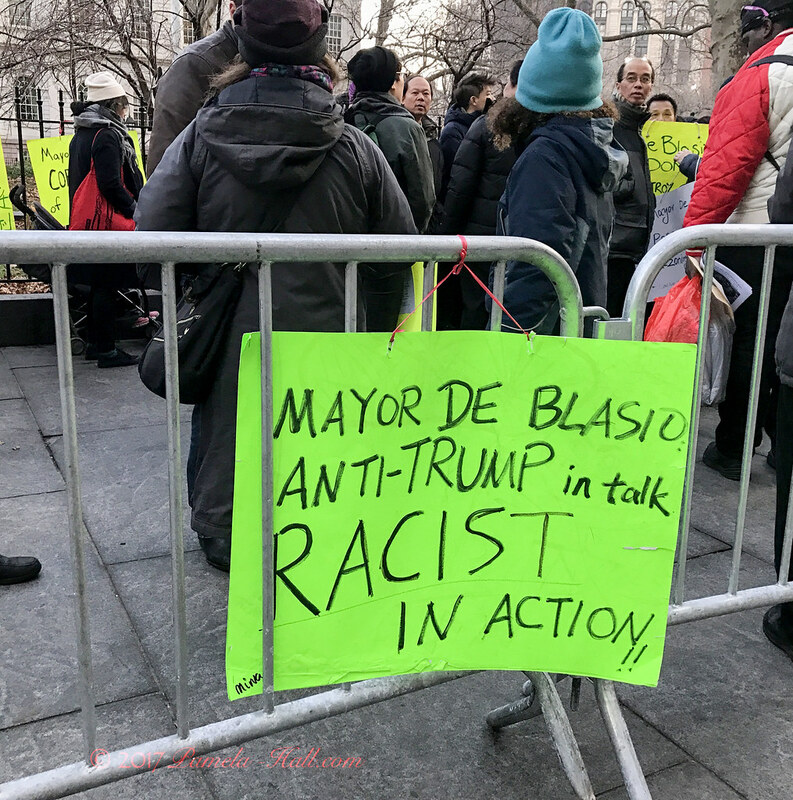 They claimed that de Blasio helped perpetuated New York City's legacy of racism and displacement by encouraging luxury developments in communities of color. 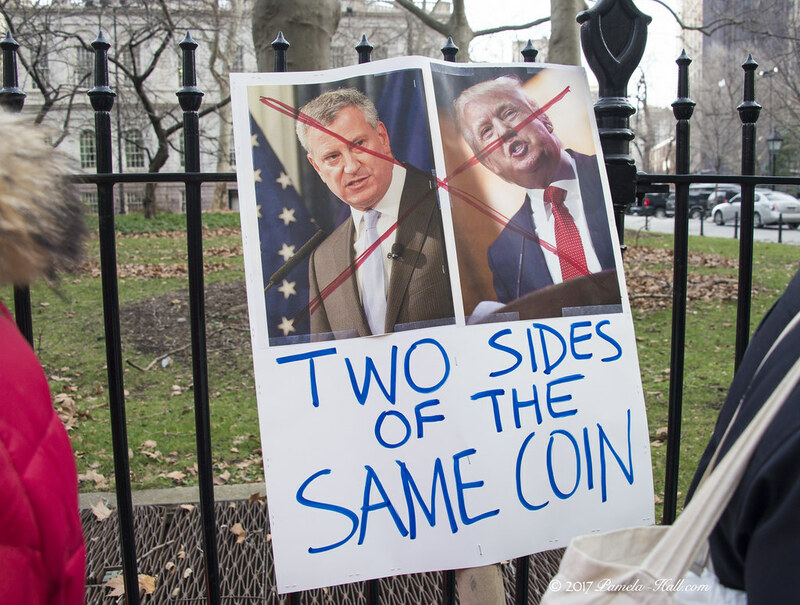 A real de Blasio hate-fest. 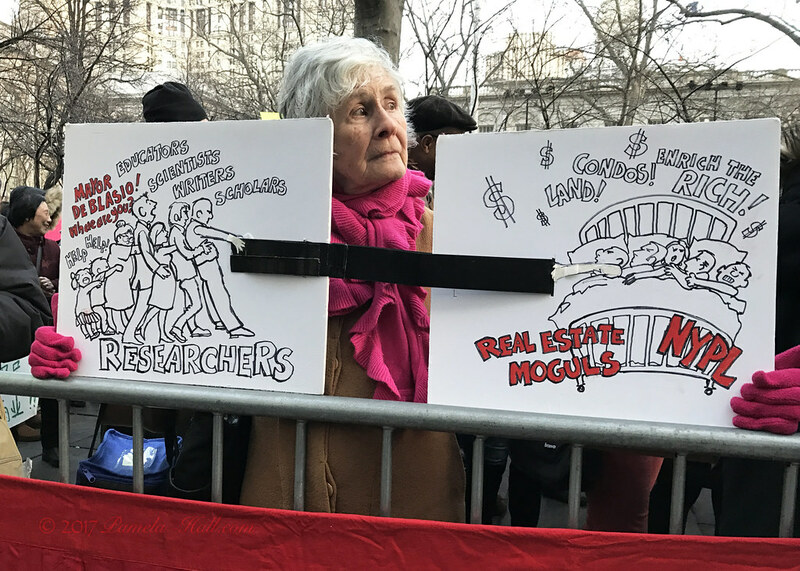 In Harlem, Williamsburg, Lower East Side and Chinatown, they said, communities are destroyed, tenants face evictions, small businesses closed and jobs lost due to high-rent and real estate tax increases in these neighborhoods. 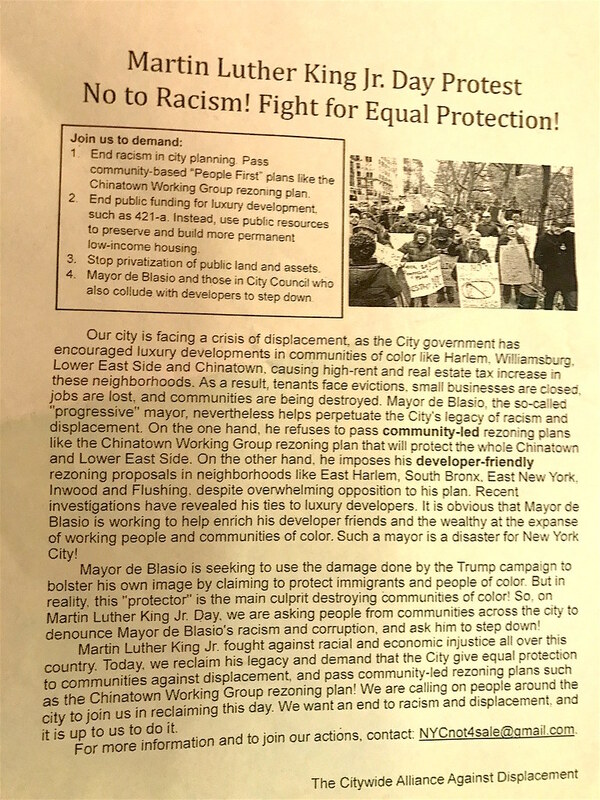 The Citywide Alliance Against Displacement feels the MLK Jr's legacy of Civil Rights should be one of ordinary people standing against injustice and racism and the investigations of de Blasio's administration has apparently revealed a preference for developers who would displace The People.